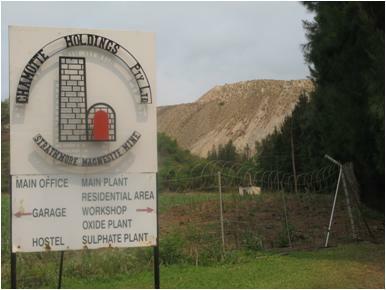 Chamotte Holdings is a privately owned mining company established in 1963 and derived its name from a calcined flint clay (Chamotte) which was the company's main business at the time. Over the years the focus of the company moved away from calcined flint clays to base minerals mining and chemical manufacturing but the original company name was retained. Today Chamotte Holdings owns the Strathmore Magnesite Mine near Malelane and the Scotia Talc Mine near Barberton in Mpumalanga, South Africa. The Head Office is located in Midrand near Johannesburg, South Africa.